It is an active bird, hardy and very easy to keep; however it is not easy to breed. First bred in the 1920s, it is the only colour canary that has an element of red as part of its plumage. It was developed as a cross between another type of finch, the now endangered Venezuelan red siskin (Spinus cucullata), and a yellow domestic canary (Serinus canaria). A well built bird, the red factor canary is about 5 1⁄2 inches (14 cm) in length. These canaries are bred for showing so therefore many versions of this canary exist today. They are divided into Melanins and the Lipochromes classes. These are further divided into frosts (soft feather) or non-frosts (hard feather), which affects how bright their color appears. 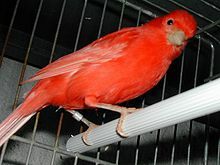 Red factor canaries are usually available at most pet stores, and can also be found through bird shows, bird clubs, breeders, and on the internet. This Fringillidae-related article is a stub. You can help Wikipedia by expanding it. This page was last edited on 13 February 2019, at 03:26 (UTC).